The other day, Mushroom pulled out his first grade portfolio in search of something or other and we both got to flipping through it. Things said by Mushroom included, “I was so young!” and, “My handwriting was terrible!” and, “Did I really write that?” and then, “I was so young!” over again. Then, later when BalletBoy was home, they pulled them all out, pre-K to present and pored over them. The table was a mess of old co-op yearbooks and Math Mammoth pages and art projects. I’m telling you, nostalgia starts young. I was especially struck by these two writing samples sitting side by side. This was before we had discovered Brave Writer (though you’ll see we were basically doing it without realizing! ), but sitting in the portfolio was this copywork from Charlotte’s Web, which was the book we were reading at the time, I’m sure. 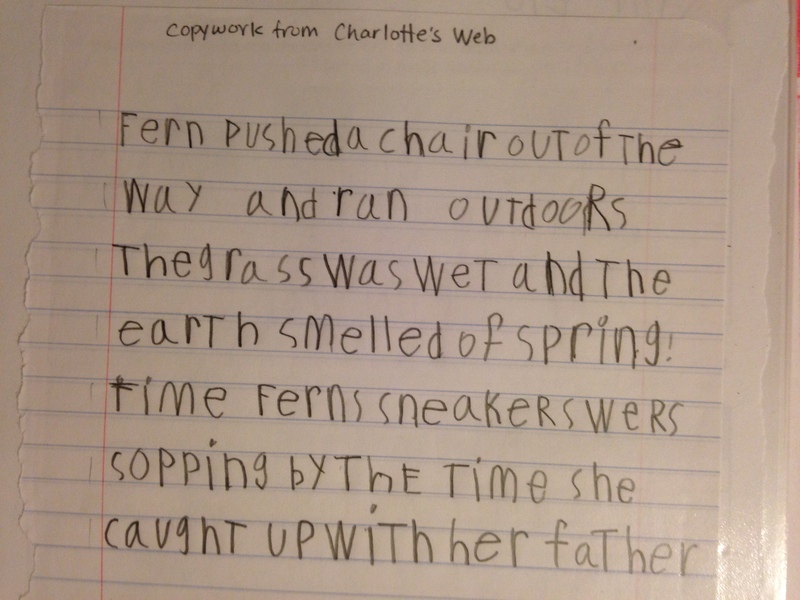 My kids still occasionally do copywork (we do a lot more dictation now) but they almost never get anything wrong. Seeing this one riddled with errors is like looking at another kid. I can hardly remember teaching this stuff. And next to it was this “freewrite” type activity that comes from Games for Writing by Peggy Kaye. I would write a boasting line and the kid would follow with a boasting line of his own. He could copy my spelling and syntax and make it his own by changing the end, which he did. 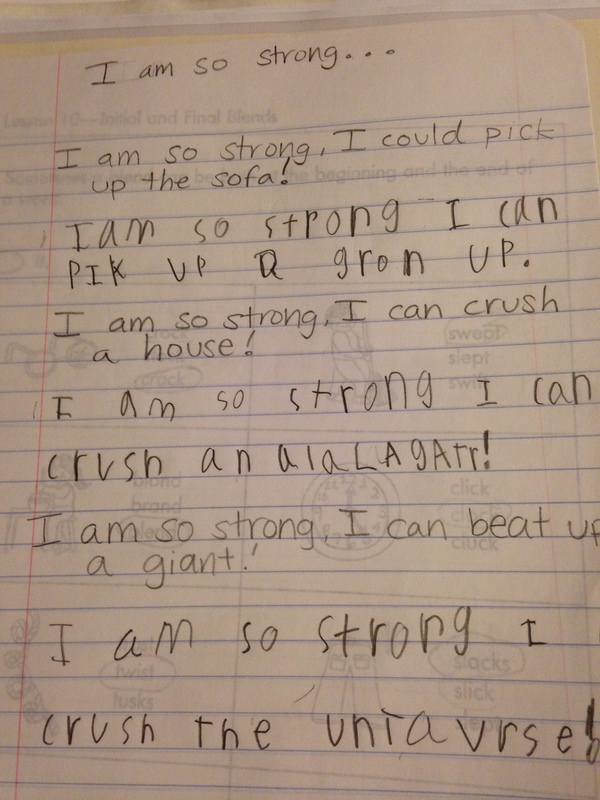 I like the final line, which is, “I’m so strong I could crush the universe.” Other Games for Writing exercises were in other sections of the portfolio, including the one where each person rolls the dice to see how many words to add to the story. We just compiled the last bits of fourth grade’s portfolios this week. Into those went a set of writings imagining they were characters in Mississippi during Freedom Summer in 1964, filled with rich words like “hollered” and “gaping” and all typed up with polished syntax and revised to add detail. Just like the copywork that I can’t remember being so difficult, it’s miles and miles away from the joint boasting writing exercise from first grade. Question: How do you know how much work to keep? Question: How do you assess your child if you don’t give grades? It’s nice to have a set of representative samples and saved items from the year. 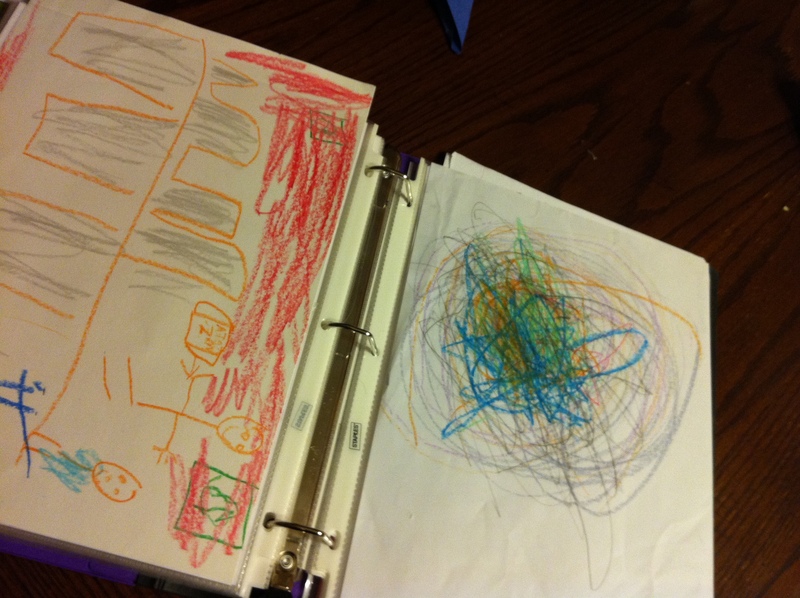 My kids (and I) already look back on previous portfolios with nostalgia. It frees you from feeling like there’s some reason to keep piles of artwork and finished workbooks. It allows you to stop and reflect periodically, which can be important for pacing your year, focusing on skills that need improvement, and celebrating growth and change. After you do the portfolio, you’ll realize that you did something, which will usually let you take a deep breath of relief. It allows the kids to set goals and reflect on their own work and progress. First of all, you need a binder to keep things in for each child. 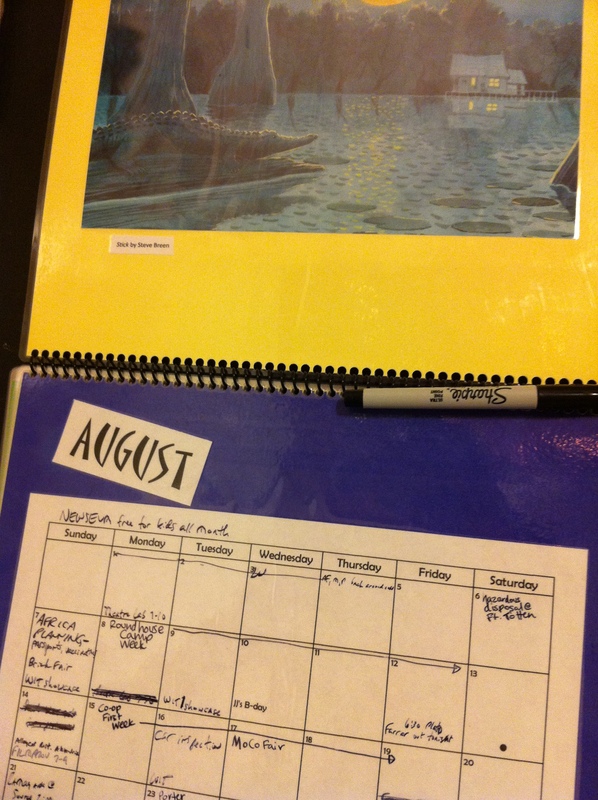 You use the same binder to go through this process several times over the course of the school year. 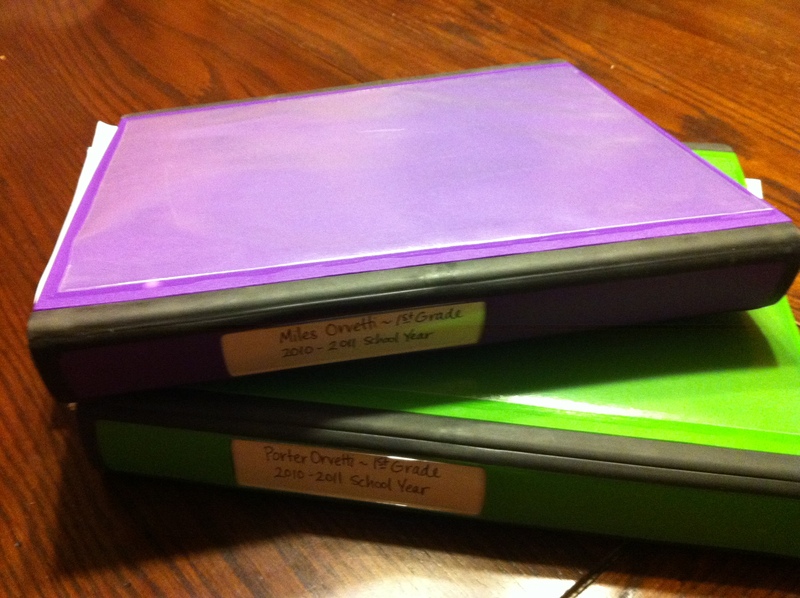 I’m especially fond of the Staples Better Binders, which are pricey, but come in pretty colors and are extra durable. Ours is currently a 1″ binder, which is just enough. If you choose to keep stuff the way we have, you also need a box of sheet protectors like these. I know it seems like a terrible waste, but if you’re planning to keep the portfolio long term (as I am) then that helps. Plus, it helps keep the whole thing easy to browse and uniformly neat. Finally, you need a place to stash artwork and stray worksheets or writings until it’s time to go over it. For me, the beauty of my system is that we don’t have to consider it until portfolio time. In the meantime, it gets shoved into a little cubby for each child. 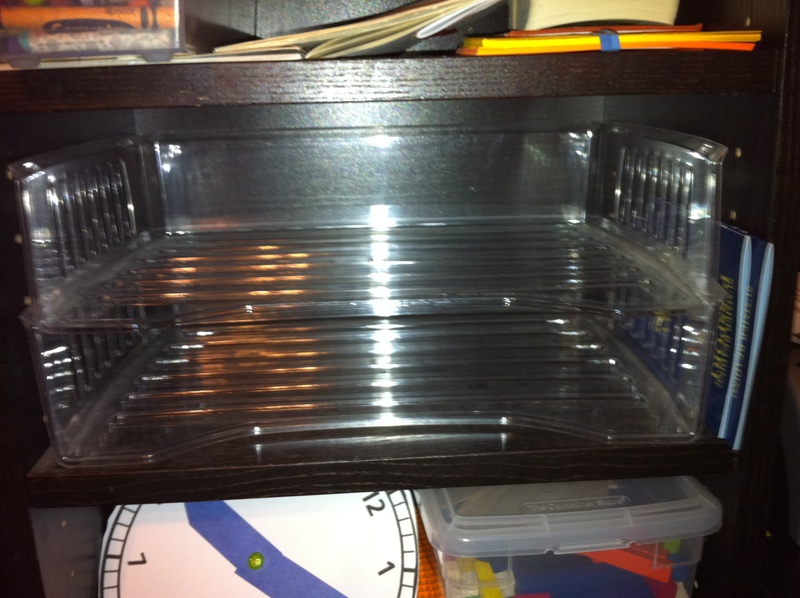 Below is a picture of our cubbies, just two paper trays, all cleaned out. Usually, they’re stuffed full. The list is the easiest part. I simply draw from our calendar to remember all the outings and field trips. The summary of materials and progress for each subject is also usually very easy. I update anything that needs to be changed, such as which volume of Explode the Code the kids are on or which topic we’re up to in history. Each subject only has 2-4 sentences so I keep it short and sweet. It may be slightly hard for me to assess how hard this might be for other homeschool parents. 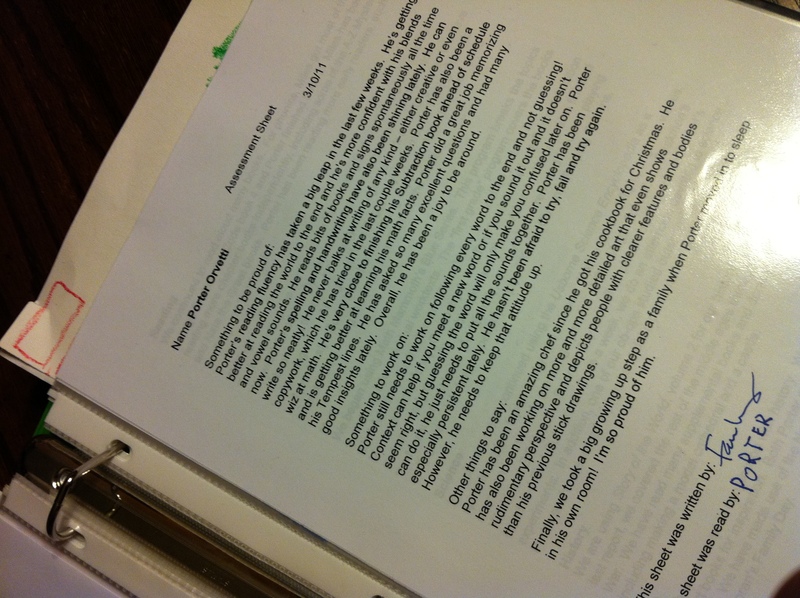 As a teacher, I had to write hundreds of narrative assessments for students over the years. I can knock these out pretty quickly and I find writing them pretty intuitive. Basically, I just think about my kids and answer those three questions. I consider academics, especially the three R’s, social and emotional issues, and behavior. After I’ve written them, I always consult the Husband and see if I’ve left out anything essential. 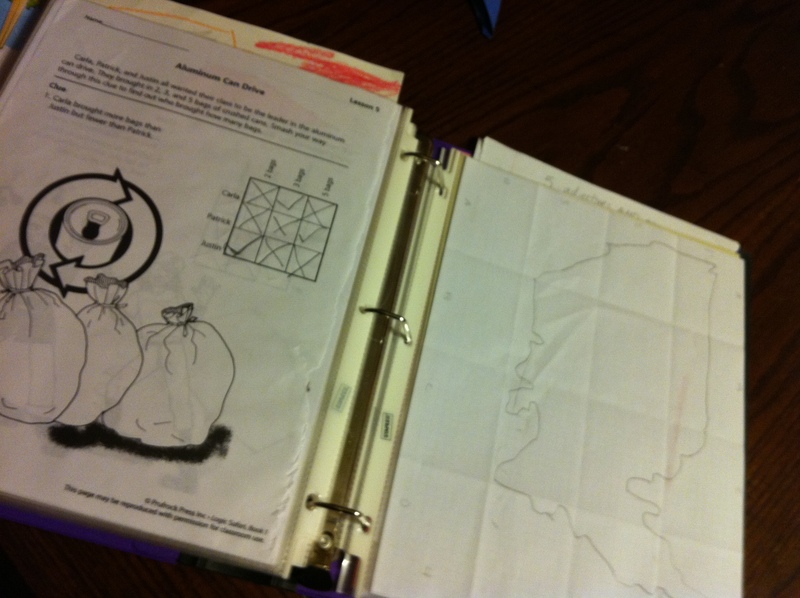 The three pages of the assessment get tucked into a sheet protector and go in the portfolio. These mark the beginning of the assessment period. They’ll be followed by the goals and sample work. Then the next set will go in after, keeping the whole thing chronological. The example below is one of the longer assessments I’ve done. Sometimes, they’re barely half that. Next, it’s time to set some goals. This is a pretty simple process. I ask the kids to come up with 2-4 goals for the two month period. They should be realistically achievable goals and as specific as possible. If a goal isn’t measurable, then it’s hard to know if you achieved it. I remind the kids they can set goals for reading, writing and math or for other areas of life like sports, games and friends. Both Mushroom and BalletBoy often set a video game goal, such as to finish a certain level. Other goals they’ve chosen include to kick the soccer ball during a game, read a certain number of books, and try a certain number of new foods. I type up the goals (when they’re older, they’ll have to do this themselves) and put that sheet in with the assessment sheets I wrote. Next, we pull out that huge mess of artwork and stray papers. I stack up the current workbooks with them. The kids must go through it all and cull until they have chosen a small pile of samples, usually between 5-8. I put a checklist on the board telling them what categories of work they must include, such as a page of math, a page with writing, a page of logic, etc. Ideally, they will choose a piece of work that is especially memorable for them or of which they’re especially proud. 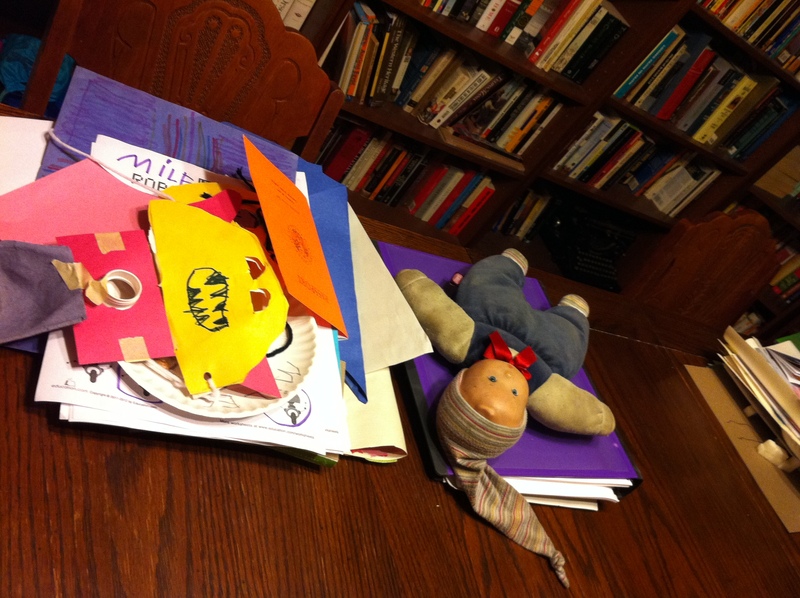 You can see the work and the portfolio ready to be sorted (along with BalletBoy’s favorite doll) below. As they choose samples, I choose samples too. I also choose “best work” examples, because that’s the type of portfolio we’re compiling. But you can see below that sometimes, such as BalletBoy’s “black hole” picture, that the choices may mostly be personal. Anything that is too large to fit in a sheet protector either gets trimmed (if it’s just ever so much bigger) or photographed and printed off. Each sample goes into a sheet protector and into the binder. You can see that some bits are sticking up a little above the sheet protectors. 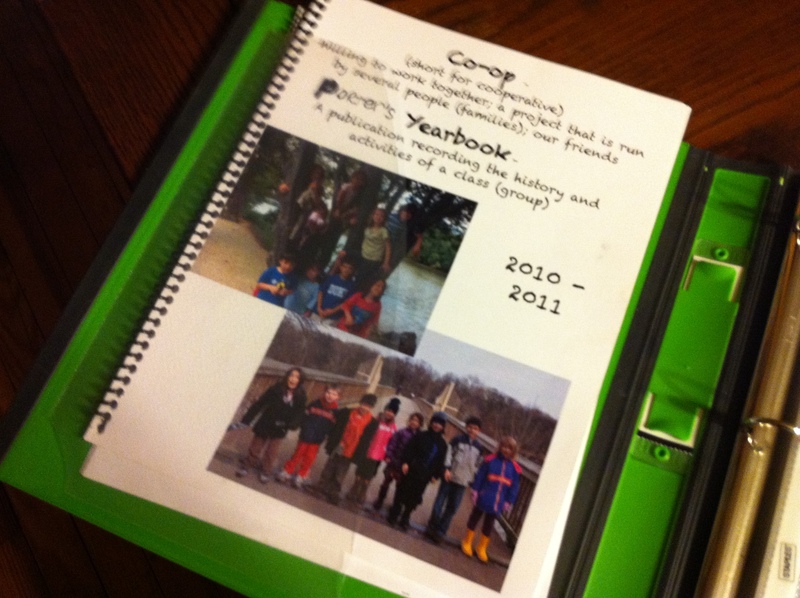 Then (and here’s the relief part), all the other work, including any finished workbooks, go into the recycle bin. Whew. The last step of portfolio process is reading the portfolio. Each child gets to sit by himself with me to do the first reading. I read them the entire assessment, including the lists (though I usually skip the subjects section). We talk about anything that comes up in the assessment, such as how they’re going to work on things that have been hard or if they’re really proud of their accomplishments. Next, he shows off all the pieces of work in the portfolio and tells me about each one. When we’re satisfied, then I take the front assessment sheet out, the one that says things to be proud of and things to work on, and we each sign it. 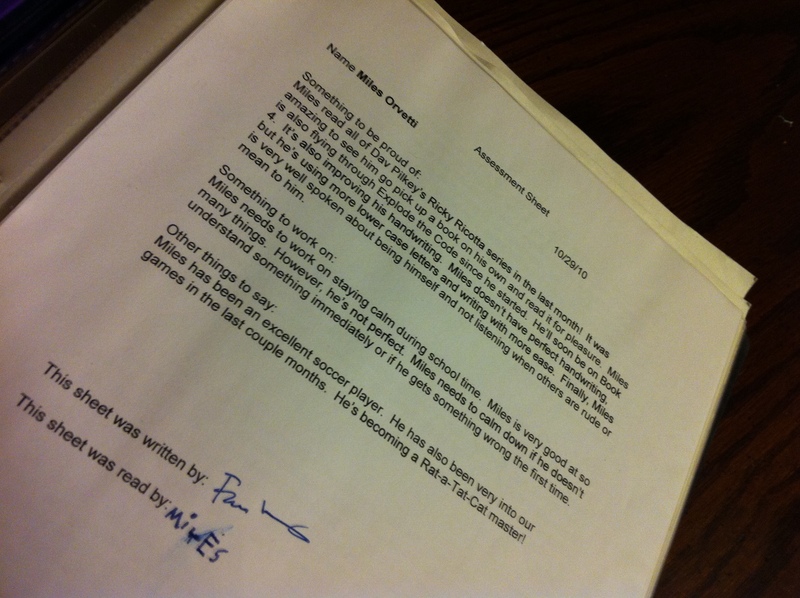 Can you see that BalletBoy and I both signed the bottom of the page there? Finally, each child is expected to show the portfolio to someone else. Usually this is the Husband, but occasionally it’s visiting grandparents. They have to show off the work from that section and tell about it. At the end of the school year, the portfolio binder has had this same process happen 5 or 6 times and is usually ready to burst. I also stick other important things inside the pockets, including our co-op’s little yearbook and the kids’ science journals. The portfolio gets a final read all the way through then goes up on the shelf in the basement. You can see things shoved into the binder pockets below. A lot goes into our portfolios, but the reality is that I don’t have to do anything to keep them updated on a daily or even weekly basis. As long as I jot down one word notes on the calendar for field trips (and, really, even if I forget) and shove all the random doodles I come across into the kids’ cubbies, then one day every two months allows us to get the whole thing taken care of. To me, that day is worth our time because it does give us room for a little breath of reflection. Not to mention that it allows me to be lazy about assessment all the other days!